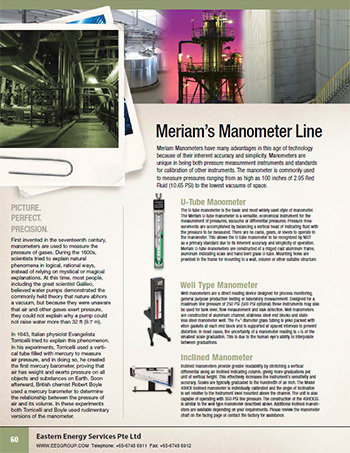 Eastern Energy Services Pte Ltd supplies the complete range of Meriam Manometers. Manometers are known to be very accurate so they are often used as calibration standards for other instruments. They range from simple U-tubes and wells filled with liquid to portable digital instruments with a computer interface. 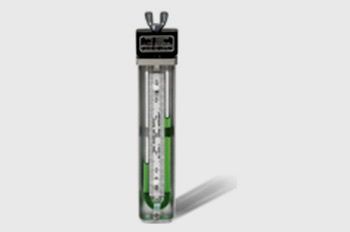 The Multiple Tube Well Type Manometer is robustly constructed with separate channels. The end blocks are constructed in stainless steel while the framed window keeps out dirt and moisture. The Inclined Well Type Manometer for wall mounting is offered with scales from 20″ to 60″ long in differential ranges from 2″ to 20″. This economical and durable instrument fills the high sensitivity and accuracy requirements for low differential pressure ranges at operating pressures up to 350 PSI. Inclined manometers provide greater readability by stretching a vertical differential along an inclined indicating column, giving more graduations per unit of vertical height and increasing the instrument’s sensitivity and accuracy. Inclined manometers frequently have scales graduated to hundredths of an inch. The Model 40HEX35 is often used to indicate differential across Meriam Laminar Flow Elements, Accutubes and Orifice Plates in gas flow applications. The removable well is bolted to the back plate and connected to the glass tube through the lower end block. All pressure connections are 1/4″ female pipe thread. The scale with satin background, bold black figures, and precision graduations spans the full channel width behind the indicating tube. Scale and tube are protected by a transparent cover. Each Model 40HEX35 is individually calibrated and the angle of inclination is set relative to the instrument level mounted above the channel. The instrument finish is black textured urethane. 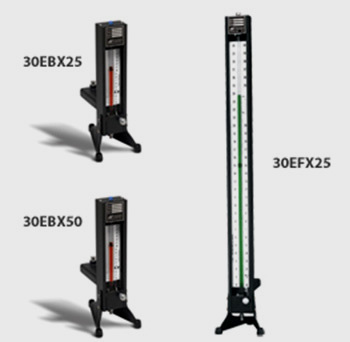 The Meriam Model 30EBX25 and 30EFX25 well type manometer are direct reading manometers designed for process, general purpose production testing, or laboratory measurement of pressures, vacuums or differential pressures. Designed for a maximum operating pressure of 250 PSIG,* these instruments can also be used to measure flow, tank level, and pressure drop or distribution across operating equipment. Raised wells can be furnished so positive and negative pressures or reversing flow can be indicated without changing the pressure connections. Various mounting styles to satisfy installation requirements are available. The manometer body is of aluminum channel construction. Stainless steel end blocks, for packing the glass indicating tube, are screwed to the body. The 7/16 outside diameter glass tubing is yoke packed with viton gaskets at each end block and is supported at spaced intervals to prevent tube distortion. The welded stainless steel manometer well has a large cross section and is readily removable for greatest ease in cleaning. Two 1/4 female pipe connections are provided on the top side of the well; one outlet is normally used for the high pressure manometer connection, while the other, provided with a plug, is used as the well fill connection. The unit scale, located directly behind the glass indicating tube, extends the full width of the instrument body and is graduated on each side of the indicating column. This scale has a white, non-glare satin background with black graduations and figures, and is compensated for liquid level change within the manometer well. The scale is adjustable for zero indicating fluid level by means of a non-slip, flexible shaft adjustment located in the lower end block and operated from the front of the instrument. A transparent plexiglass cover protects the unit from dust and moisture. All exterior portions of the manometer are finished in textured, black urethane paint. Standard pressure connections in the upper end block and at the manometer well for connecting the instrument are 1/4 female pipe connections. Suitable drain, fill and vent plugs are furnished with each unit. Inclined Well Type Manometer for wall mounting is offered with scales from 20″ to 60″ long in differential ranges from 2″ to 20″. This economical and durable instrument fills the high sensitivity and accuracy requirements for low differential pressure ranges at operating pressures up to 350 PSI. Inclined manometers provide greater readability by stretching a vertical differential along an inclined indicating column, giving more graduations per unit of vertical height and increasing the instrument sensitivity and accuracy. Inclined manometers frequently have scales graduated to hundredths of an inch. The Model 40HEX35 is often used to indicate differential across Meriam Laminar Flow Elements, Accutubes and Orifice Plates in gas flow applications. The removable well is bolted to the back plate and connected to the glass tube through the lower end block. All pressure connections are 1/4″ female pipe thread. The scale with satin background, bold black figures, and precision graduations spans the full channel width behind the indicating tube. Scale and tube are protected by a transparent cover. Each Model 40HEX35 is individually calibrated and the angle of inclination is set relative to the instrument level mounted above the channel. The instrument finish is black textured urethane. The U Type Manometer is a versatile, economical instrument and is the primary basic standard of pressure measurement. Pressure measurements are accomplished by balancing a vertical head of indicating fluid with the pressure to be measured. As there are no cams, gears or levers to operate in the manometer, the readings obtained are always accurate. Mounting holes are provided in the frame for mounting to a wall, column or other suitable structure. The clean-out head at the top of the instrument seals the indicating tube legs and also provides for the external pressure connections to the manometer. The manometer head fastens to the body by a single nut and is quickly and easily removed when necessary. A 1/4″ female pipe connection is provided out the left and right sides of the clean-out head as standard. Pressure connections at rear or top of head can be furnished when specified. Manometer clean-out heads of cast iron, stainless steel or PVC are available for special corrosive applications. The Model 20DAX40 manometer is designed for the measurement of pressures, vacuums or differential pressures with a maximum operating pressure of 400 PSI. This manometer is of very rigid construction designed primarily for high line pressure operation. Only carefully selected, fully annealed glass tubing is used. 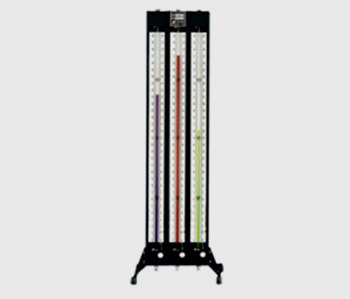 The manometer scale is located to permit quick and accurate reading of the indicating columns. The U-tube type manometer is a primary basic standard of pressure measurement. Pressure measurements are accomplished by balancing a vertical head of indicating fluid with the pressure to be measured. As there are no cams, gears or levers to operate in the manometer the readings obtained are accurate. The manometer body has an aluminum channel to which stainless steel and blocks are connected. The wetted parts are type 304SS. The glass tubing is gland packed with viton gaskets at each end block and is supported at spaced intervals to prevent tube distortion at elevated pressures. In place of the conventional U-tube of one continuous glass length, two straight length individual tubes are used in this manometer. To connect the two vertical glass tube legs to form the U, the lower manometer end block is cross-drilled. Standard pressure connections are 1/4 inch female pipe out the top of the upper end block.